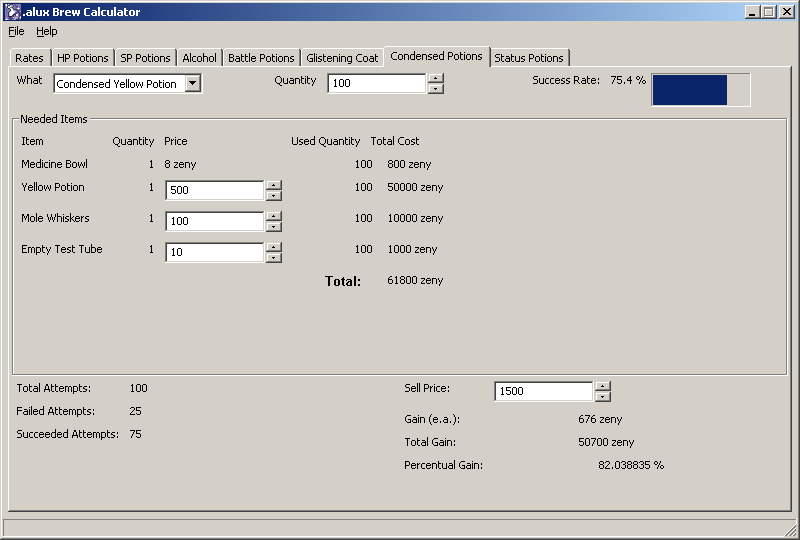 This program calculates brewing rates for Alchemists in Ragnarok Online, as well as the costs and the gain of the brewing process. This program is open source, and it is released under the terms of the GNU General Public License v.2. 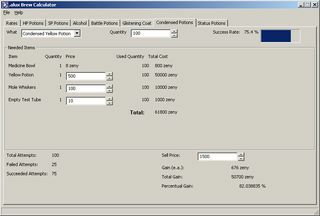 .axBrew updated to version 4.2.1 R1 [based on .axForge 4.5.1R1]. 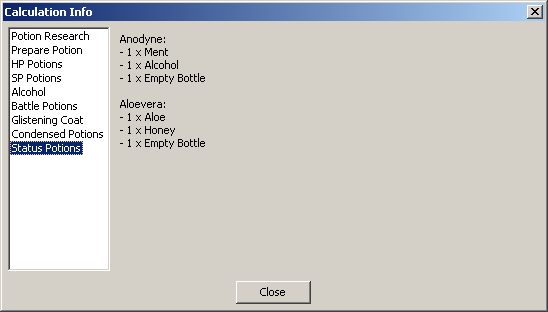 Fixed some constants in the the brewing formulas to make them more reliable. Fixed some typos and outdated mechanics / skill information. 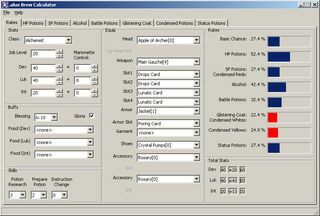 Fixed some wrong Battle Potions ingredients. .axBrew updated to version 4.0.0 RC [based on .axForge 4.4.0RC]. 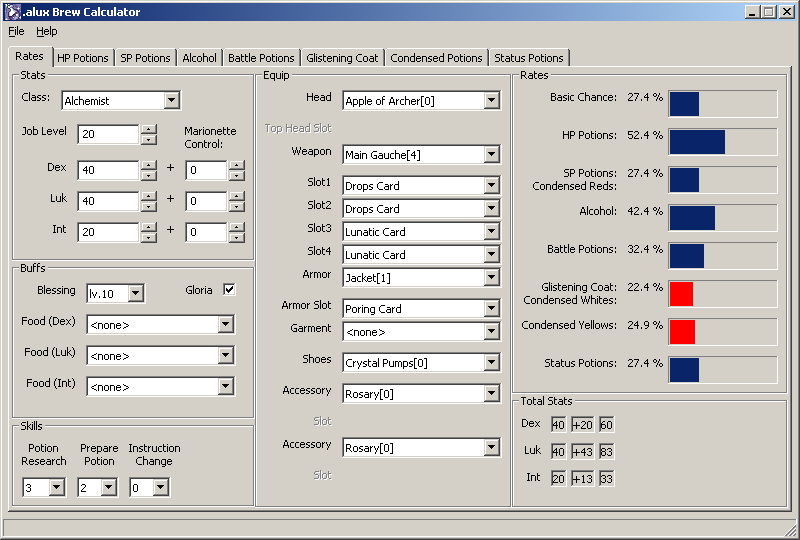 Fixed several bugs in equip calculation code. .axBrew updated to version 3.0.0 RC [based on .axForge 4.3.0RC]. Updated equip management code. 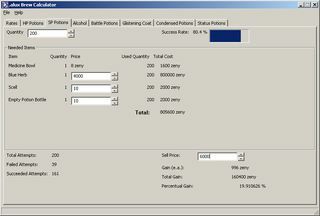 .axBrew updated to version 2.0.3 R3 [based on .axForge 4.1.1R1]. Updated brweing formulas to Ragnarok episode 11 andadded support for creator/biochemist and homunculus. Fix any bug that will be found. They will be found for sure. And they will be as hidden as needed to let me be unable to find them, but as critical as needed to be found out by anyone else in a few seconds.